If you are reading about this, there is a good chance you are suffering from headaches or migraines. It might be disrupting your life, you might have missed work or you are just sick of feeling miserable and want to enjoy life again. You have probably had enough and want to know if your headaches can be resolved. If you are unsure whether we can help, don’t be afraid to see us. You will probably get relief much quicker and easier than you realise. The types of headaches we see are typically due to problems in the neck. By helping improve these problems, we have helped many sufferers gain relief from their pain. Some have got rid of their headaches within a couple of sessions, others have taken longer. This depends on what’s wrong and how long you’ve had problems for. Once your headaches are better, we will also advise you on how to prevent your headaches from returning. Relief may only be a phone call away. Come and see us and we will do our best to help relieve you of your headaches. You can call us on 0151 707 8111 or send us an email. If you have a headache, you’re not alone. Many of us suffer from headaches. Whilst some of us have the occasional mild headache, others can have very frequent episodes. The headache itself may be a dull ache or a throbbing, intense and debilitating pain. Headaches that we can help with originate from problems in the neck and we refer to these as being cervicogenic (cervical spine related). You may have irritation of the joints and nerves in your neck or spasm and tightness of the muscles in your neck and upper back. You may have neck pain with the headache and your neck movements may be restricted or moving your neck in certain ways may make your pain worse. Your muscles may also be tender but especially so at the base of your skull and neck. One of the causes of neck problems is thought to be poor posture. Sitting in one position for too long or sitting the wrong way can lead to the development of muscle and joint problems in your neck. Severe stress and wear & tear can also lead to problems in your neck. Chiropractic is very successful in treating headaches. Research shows that spinal manipulation, the primary form of care provided by Doctors of Chiropractic, is effective for headaches including migraine prevention. 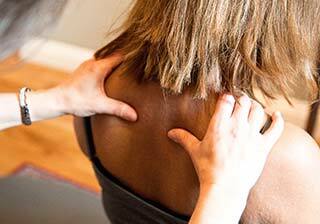 Chiropractic helps by correcting mechanical problems to do with the muscles and joints in your neck. We also provide advice on posture, work posture, exercises, relaxation techniques and nutrition. If you have been diagnosed with Migraines you will know that they are very intense throbbing headaches, usually at the front or on one side of the head. You may also have other symptoms such as nausea, sensitivity to light or blurry vision with the headache. Migraine is a relatively common health condition, affecting many adults in the UK. It affects more women than men. Some people have attacks frequently, up to several times a week. Others only have a migraine occasionally. It is possible for years to pass between migraine attacks. A migraine can be very disabling and can severely affect your quality of life. Some people need to stay in bed for days at a time causing disruption to their daily and work life. Classical migraine - is when you have a warning sign, known as aura, before the migraine begins. Warning signs may include visual problems such as flashing lights and stiffness in the neck, shoulders or limbs. Common migraine - is when there is no aura. Before a migraine attack, you may experience changes in mood, concentration, energy levels, appetite and various aches and pains. This can be followed by aura. Symptoms of aura can include flashing lights, zigzag patterns or blind spots. The headache itself is usually disabling with a pulsating or throbbing pain on one side of the head. You may have nausea or vomiting and extreme sensitivity to bright lights and loud sounds. You may find yourself wanting to lie down in a quiet, dark room. The headache can last anywhere between four hours and three days. Most attacks gradually fade away. Some people find the headache stops suddenly after they have been sick. Sleep often relieves the symptoms. You may feel exhausted and weak afterwards. The exact cause of migraines is not fully understood. They are thought to be caused by changes in brain activity affecting nerve pathways, chemicals and blood vessels in the brain. There may also be a genetic link. Serotonin (the ‘feel-good’ chemical) is necessary for communication between nerves and helps regulate pain. Its levels are reduced during a migraine, making the blood vessels in a part of your brain narrower. This may cause the symptoms of aura. Soon after, the blood vessels widen, and this is thought to cause the headache. The reason for the drop in serotonin is not yet known. Some scientists believe there is a link between fluctuating levels of hormones and migraines. Some women experience migraines around the time of their period. This is known as a menstrual migraine. The levels of oestrogen drop just before women have their period. This theory however has not been fully proven. There are many triggers for migraine and for each person the trigger is different. Triggers include emotional, physical, dietary, environmental and medicinal factors. Emotional – stress, anxiety, tension, shock. Physical – tiredness, lack of sleep, shift work, poor posture, neck or shoulder tension, travelling for a long period of time. Dietary – dieting (not eating enough food), irregular meals (fluctuating blood sugar levels), dehydration (not drinking enough water), alcohol, MSG and tyramine (food additives), tea and coffee (caffeine), chocolate, citrus fruits and cheese. Environmental – bright lights, flickering screens (television or computer screen), smoke, loud noises, changes in humidity or temperatures, strong smells, a stuffy atmosphere. The menopause can also trigger migraines. Some medicines such as the contraceptive pill, HRT (Hormone Replacement Therapy) or sleeping tablets can trigger migraines as well. Research shows that chiropractic treatment is very effective in the prevention of migraines. We know this from personal experience as we have helped many migraine sufferers get relief from their disabling pain and get back to enjoying life again. If you are suffering from continual migraines, come and see us to find out how we could help you. Avoid triggers – keep a migraine diary to find out if you get migraines after eating certain foods. Have breaks – if you spend a large amount of time in one fixed position, such as in front of a computer, on a sewing machine, typing or reading. Take a break at least once an hour and do gentle neck stretches. Do low impact exercise such as walking or swimming. Drink at least eight glasses of water a day – to help avoid dehydration.